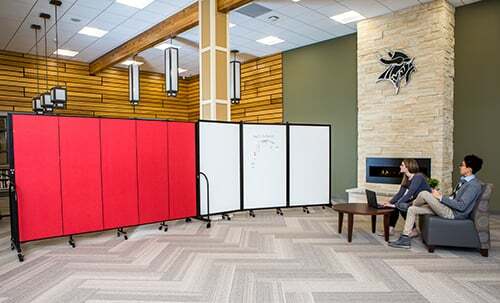 Since entering the room divider market more than 26 years ago, Screenflex has maintained a clear focus on quality and innovation in an effort to provide customers with premium room dividers they can count on. We understand that room dividers get a lot of use and can be an essential piece of furniture in your facility, which means choosing the right color partition for your facility is especially important. That is why Screenflex follows the trends in fabric and vinyl styles and colors to ensure our room divider colors compliment the design of any open space. We believe the color room divider you choose says a lot about your facility, the use of your space and the over feel you are trying to achieve with your room divider. “The strategical use of color can either enhance the design of the area or complement the existing space,” states Amy O’Connor, Screenflex Sales Consultant. 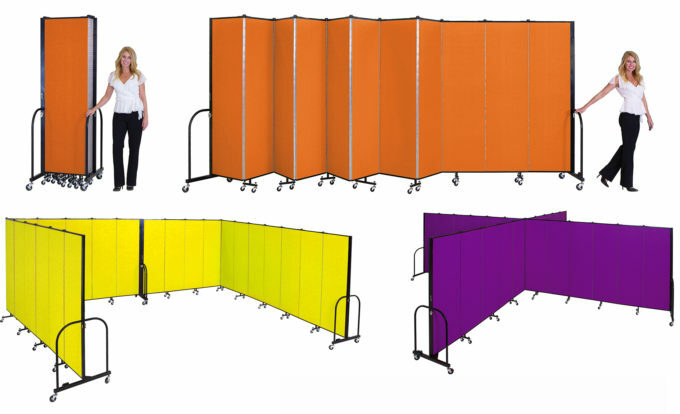 To assist you in choosing the best Guilford of Maine fabric or vinyl for your movable divider, we’ve compiled this full list of color options to help you find your way through all the ins and outs. Our most popular performing fabric line is our Designer colors. The Designer fabrics are made from a 100% polyester blend and range from neutrals to vibrant colors. Polyester is ideal for room dividers because of its excellent strength, easy cleaning, and resistance to fading, wrinkling, and abrasion. This durable fabric resists pilling as well as damage caused by staples or tacks. Designer fabrics can be used on all Screenflex products, and all facility uses. Excel fabric options are a stitch bond fabric made from 100% polyester. This fabric line appears consistent in color throughout the material and is offered in neutral tones which are sure to compliment any decor. The soft finish fabric is designed for durability, cleanability, resistance to soil and fading, and the ability to withstand continuous use of tacks, pins, and staples. This dependable fabric is an excellent choice for most markets and any Screenflex product line. The tight woven Select upgraded fabric line is constructed from durable wool and 100% recycled polyester blend. This combination of natural and synthetic fibers helps the fabric withstand basic wear and tear and makes it easier to spot-clean when necessary. Select fabric can be used on Standard, WALLmount, Heavy Duty, Display Towers, and GSA product lines. Screenflex mildew resistant upgraded Vinyl is easy to clean and simple to maintain making it ideal for healthcare, hospitality, or pet care industries. However, the vinyl finish is not recommended when tacking is required. The neutral royal vinyl colors boast a weave-like pattern for a professional finish. Want to add a mural or logo to your divider? We offer to print directly on to any one of our eight vinyl colors. Contact a Screenflex design consultant for more information on personalizing your Screenflex room divider. A vinyl finish can be used on our Standard, WALLmount, Heavy Duty, Healthflex, FlexFit, and GSA dividers. Screenflex is all about quality. That is why we only provide fabrics we can count on for their durability and longevity. Still, have questions or looking for the perfect color? Let our experienced Screenflex sales consultants assist you. Our sales team can provide you with large fabric or vinyl samples and walk you thru the purchasing process.